Here's why it's possible that all the ice in the world melting won't make much difference. The natural increase in sea level is real, but it’s already reached its peak performance. 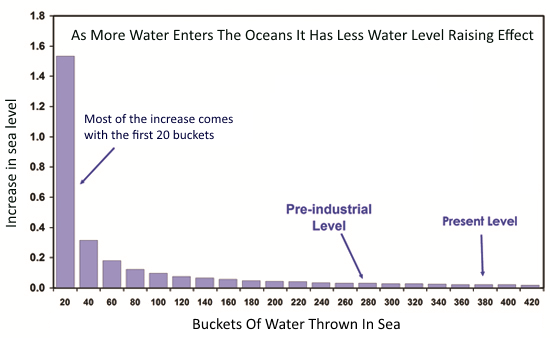 This graph shows the additional warming effect of each extra bucket of healthy H2O, a life giving liquid not a pollutant. When someone pointed out this basic chemistry to me, it resonated, and again I marvelled that something so basic had been carefully not mentioned in this debate. I realize log curves are not something you want to reach out to the public with in detail, but I felt everyone who has done chemistry at university would grasp this point quickly. It explains the paradox: It’s true that water has some sea level raising effect, but it’s also true that extra water doesn’t have the same effect. When alarmists point out that the natural melting of ice sheets causes “X meters of sea level rise,” they usually fail to mention that the first 100 buckets of water does almost all of this, and no extra 100 bucket addition will ever do as much. It’s a lie by omission. Au contraire! This article brings some much-needed intellectual rigour to the sea level discussion. What is lacking is a simple IQ Test that has to be passed before this article can be read. If sea level rises the extra water will eventually overflow the rim of the sea and drain away quite naturally. As water is what plants drink this will be a good thing. Otherwise known as Miami real estate. Actually the more water comes into the oceans, the more weight there is on the ocean floor which makes it sink deeper, which leads to a constant sea level on the surface, therefore no need to panic at all. It's such a beautiful yet simple and intuitive mechanism. This displacement causes mountains to rise, which is why warmunists keep talking about the glaciers receding. They aren't receding, they're getting taller! Unknown is a troll for suggesting we think the earth is flat. Banning is in order. If the earth were flat, how could the sun rotate around the earth? Up until 2007, alarmatologists claimed that the OCEANS would rise by several FEET during the next century. Since 2008, they now say that SEA level will rise by 2 METERS. Why the change in terminology? I smell deception (orange-scented). This flip-flop invalidates their climate alchemy. Actually, perceived sea shore subsidence won't happen, as any extra heating causes post-ice water to go into the atmosphere and stay there. Extra CO2 and extra H2O will create more and bigger plants, trapping some water. As well, more water will freeze at high altitudes, increasing the height of glaciers and ice caps, and leading to more freezing in a runaway chain-reaction process. Climate diviners would figure this out if their research funds weren't being diverted to pay for private jet trips to attend Formula 1 race weekends. And they condemn people for driving their cars. Callous hypocrisy!! As all land is floating on the ocean surface, I don't think we have to worry about "rising sea levels". Maybe a bit about sea sickness, but that can be fixed with a pill. Thank you, thank you, Prof Inferno. I confess that this so obvious aspect of ocean chemistry had completely passed me by. How silly I was. My husband, the former chemistry teacher, is not here at the moment. I'll have to ask him when he's available. I'm sure he will explain all the details for me. Oh! Why didn't anyone tell me you were back! I have missed you so! A reverse hockey stick . Cunning to attack their propaganda with the same methods but using real data not adjusted fabrications . If the hockey stick goes down towards the shaft it shows no warming in fact it must confirm we are entering the next ice age. Those warmmongers in the worlds scientific establishments think we are dumb. You really show them up for the over edumacated fools they are . De Grasse pur sang- If he can say what he wants about history, expect anti-historians on both sides of the constructed frame of framing to do the same. What an amzing blog you have just shared here which is quite informative and innovative and in terms of presentation it was also up to the mark. After reading your blog I must say that you are a very hard working and dedicated person towards your work so cheers to that and keep sharing more and more. You have just pick the wright way to portrait your thoughts to a large number of audience just by sharing this interesting and innovative post with us and I really like the way you present your blog and hope to see more from you in future also. SSC exam Result 2017 will be SSC Results 2017 announced within 60 days of the exams, he said. And also added “The BTRC will take immediate SSC Results 2017 Bangladesh measures if questions are leaked in Facebook.” He further said that Bangladesh Telecommunication Regulatory SSC Results 2017 Bd Commission (BTRC) authorities have also been asked to work stopping any SSC Results 2017 Madrashah Board sort of rumor over question paper leak through any social media especially Facebook. Play 2 player games. Play game with your friend. The most beautiful 2 player games are here. Have fun. Play 3D games with high quality graphics and sound for those who love the 3D Games, as you'll find in these pages, the only person in this 3D games at specially selected for you and you can play for 2 people. Thank you for sharing knowledge us If you want to work ms office click on www.office.com/setup follow all step it is basic application for some advance and professional working person office.com/setup this application used to according your business nature.